Traditional Wooden Swing made from teak wood. 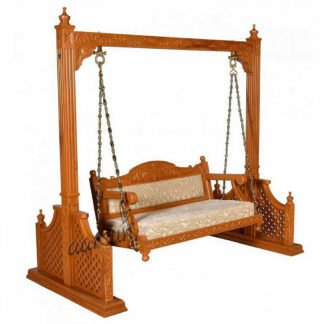 Wooden swings / Jhoola is best for your home,garden and whatever you want to place. Wooden jhoola is beautifully handcrafted in traditional designed. The unit has two strong pillars beautifully carved with central supporting a central swing. This swings shows the pillars picture a peacock theme with base handcrafted in the form of attractive peacock designs. Jhula shows the pillars carved nice-looking over with peacock design on the upper portion as well. Wooden Swings shows a knot shaped design with central floral design is provided with peacock shaped brass knobs on the upper side and brass hoops on the lower side.Wooden jhoola shows the adjustable chains with graceful human figurines attached to the central two seater swing.Wooden jhula consists two seater swing in central position with backrest image cutwork floral design and hand rest with peacock design.Indian swing with two seater is provided with fabric cushion pad with matching color combination. Jhula is show with two square cushions and two pillow.